Pure maple syrup sweetens these seasonal treats. 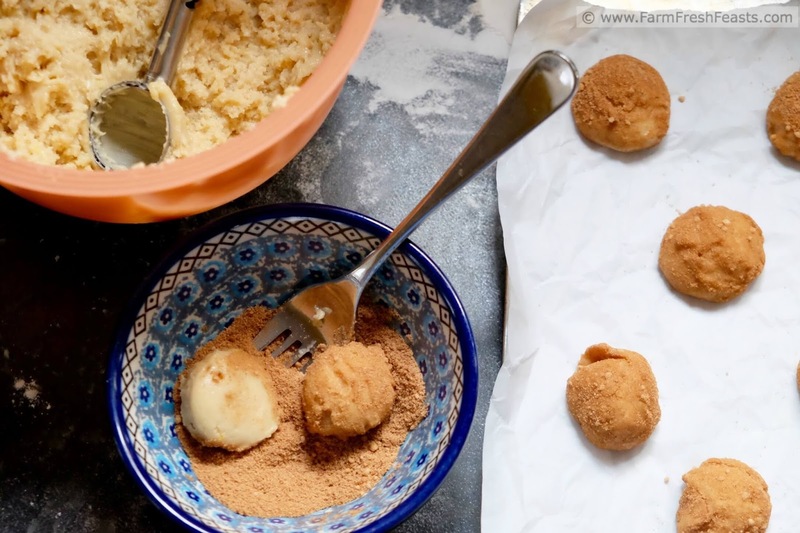 Rolled in a maple sugar and cinnamon coating, this refined sugar free version of the classic Snickerdoodle celebrates the bounty of a northern winter. A perfect recipe for #ChristmasWeek. Regular readers will notice that I've taken leave of my senses a departure from my usual recipes celebrating farm share produce. It's #ChristmasWeek, hosted by Kim of Cravings of a Lunatic and Kiss My Smoke, and I'm sharing 6 days in a row of sweet treats. If you came here looking for some local produce recipes, please check out my Visual Recipe Index by Ingredient. I went on a cookie quest for "something maple" at my library. I had a small jar of granulated maple sugar from my daughter's French class trip to Quebec. I associate maple with winter, so I wanted a maple contribution to #ChristmasWeek. Since I like to support local business and keep my cash in my local economy, I buy my maple syrup at the farmer's market. It's delicious and affordable. If you don't live in a place that produces maple syrup, I'll recommend Barn2Door where you can buy direct from the producers and have maple syrup delivered to your door! When I saw these Maple Doodles in Cookies to Die For! by Bev Shaffer (Amazon affiliate link) I thought they'd be perfect. My only hiccup was that my Canadian maple sugar is a bit too chunky to roll a ball of cookie dough in. [And trust me, I know from sizes of granulated sugar from my Finnish Pulla recipe in last year's #ChristmasWeek.] Luckily I have another use for that chunky maple sugar, coming next year. I was delighted to find local fine granulated maple sugar at the grocery store down the road. 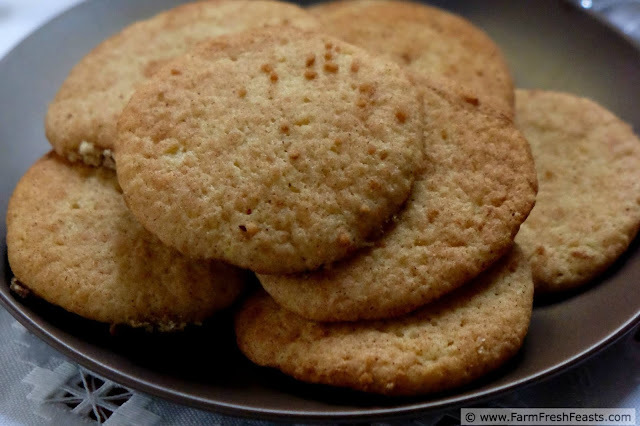 Between the local maple syrup, the local maple sugar, and the local eggs these cookies are a great opportunity to support local producers. After all, we all want to strengthen our communities, right? When I point out that these cookies are made without refined sugar I am in essence slapping a Cholesterol Free! sticker on a stalk of broccoli. Back when Cholesterol was a Thing To Be Avoided At All Costs, savvy marketers started labelling fresh raw broccoli (something that naturally contains zero cholesterol as cholesterol is derived from animal sources) as Cholesterol Free! It worked. While I have nothing against refined sugar and no desire to limit my intake any more than I usually do this time of year, I will help myself to the obvious sales gimmick of "refined sugar free!" 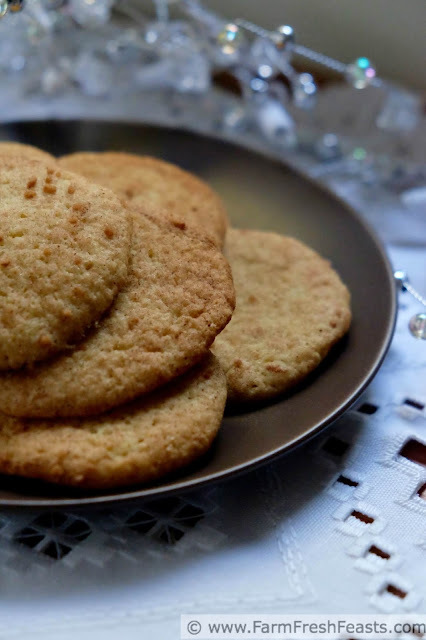 for these cookies. Will eating them send your blood glucose levels shooting up? You betcha. After all, maple syrup and maple sugar are metabolized easily. Everything in moderation. This is my second recipe for #ChristmasWeek. Yesterday I shared a Spiked Hot Cocoa Gift Mix that is allergen friendly as well as family friendly. Tomorrow I'm sharing My Scottish Grandma's Shortbread. Here are all my #ChristmasWeek recipes! Welcome to Day 2 of Christmas Week. This annual event was started in 2012, and is hosted by Kim of Cravings of a Lunatic. This year we have over 35 bloggers sharing festive sweet recipes for the event. Plus we all chipped in for a huge Amazon Gift Card Giveaway so be sure to enter! Note: This makes about 3 dozen cookies. I tripled the amounts below because I didn't feel like cutting the stick of butter into 5+⅓Tablespoons and it was just easier to grab 2 sticks (1 cup) of butter. I made the dough a day ahead of time, baked half the cookies, and froze the rest of the dough until I was ready to bake again. 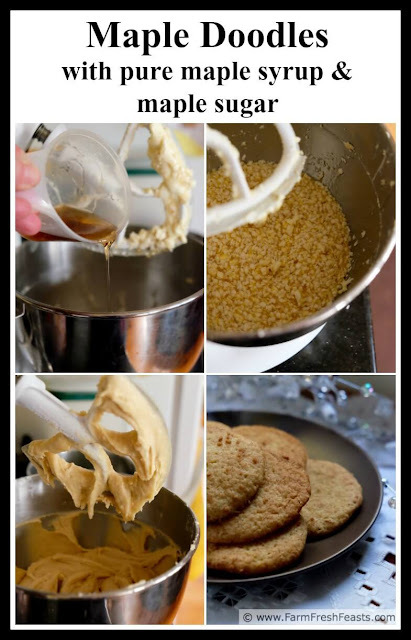 If you triple the dough but don't plan to bake it all, only mix up a single portion of sugar at a time. Maple sugar is too dear to let it go to waste, so spread any extra on a piece of toast or hot cereal. Allow the butter, maple syrup, and egg to come to room temperature. In a large bowl (I used my stand mixer) beat the butter until fluffy. Pour in the maple syrup and beat until combined. Sprinkle the salt, baking soda, and cream of tartar into the bowl and mix well. Add the egg. At this point the mixture will be a gloppy mess as shown in the title collage above. Do not despair. It will get better. It really helps to have your butter soft--if your kitchen is on the cool side like mine, maybe let the butter come to Warm Room Temperature instead. Dump the flour into the bowl in small amounts, mixing in between, until you've incorporated all the flour. You'll have a very soft dough. Chill this for at least an hour (according to the book) but I think it's better overnight. When you are ready to bake, preheat the oven to 375 degrees Fahrenheit and line a cookie sheet with a piece of parchment paper. In a small bowl, stir together maple sugar and cinnamon. Using a cookie scoop or a couple of spoons, scoop out about 2 to 3 teaspoons of dough and roll into a ball. Roll the ball in the maple sugar/cinnamon mixture, then transfer to the parchment-lined baking sheet. Bake for 10 to 13 minutes, until lightly browned. Let cool on the cookie sheet for 10 minutes before transferring to a cooling rack to finish cooling. 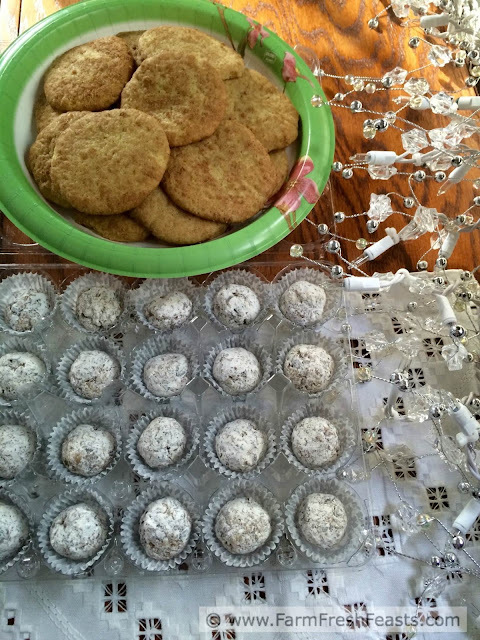 Cookies packed up for the Airman's Cookie Drive--Maple Doodles on top, and No Bake Magic Cookie Truffles on the bottom. In an egg carton. Yes, when the neighbor's coworker's chickens are molting, or the 6 yr old egg gatherer thinks it's fun to drop eggs, I need to source my eggs further afield. These cartons sure come in handy. Are you looking for recipes using seasonal produce from the farm share, the farmer's market, or your neighbor's prolific garden? Check out my Visual Recipe Index by Ingredient, a resource for folks like me wondering what to do with Swiss chard, beets, and that case of oranges from the band fruit fundraiser. Follow me on Pinterest, on Instagram, and on my FB page for even more recipe ideas and behind the scenes snapshots. Want to know How to Use This Blog? Thanks for stopping by! 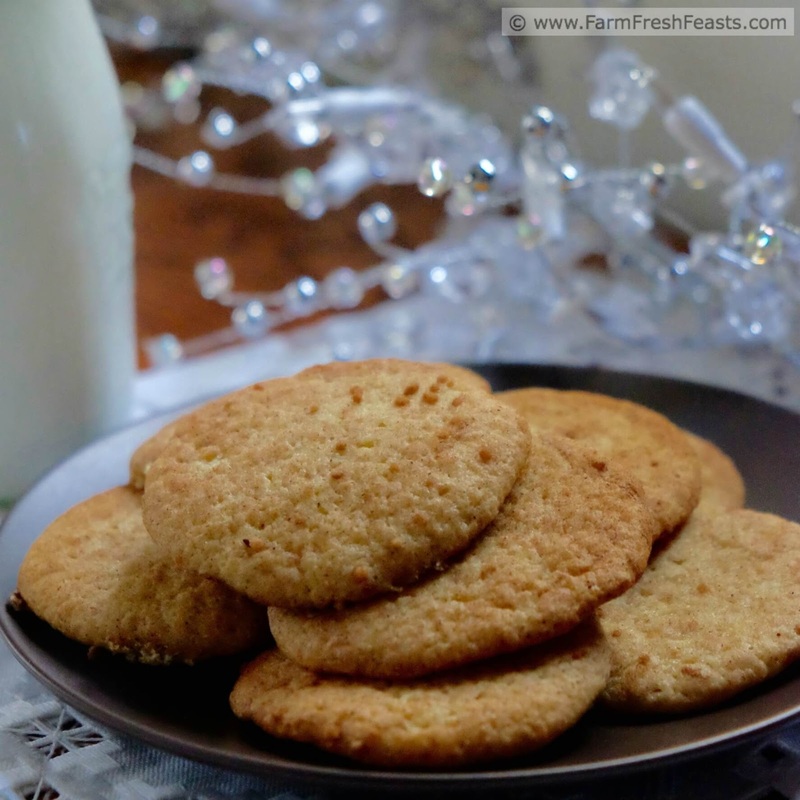 Snickerdoodles are for sure one of my favorites! Simple and easy to bake start to finish. But adding maple syrup.... woo hoo! Thank you for the recipe - I'll be making these and (maybe...) will share with Debbie! You are a Good Niece to share! But I won't tell if you keep them all to yourself! Just don't freak out when the dough is all gloppy before you add the flour. It will come together. Anything with real maple syrup in it has to be good!! Ain't that the truth! I don't consider myself much of a food snob, but I've been partial to actual maple syrup since I read the label on the bottle of Mrs Butterworth's years ago. 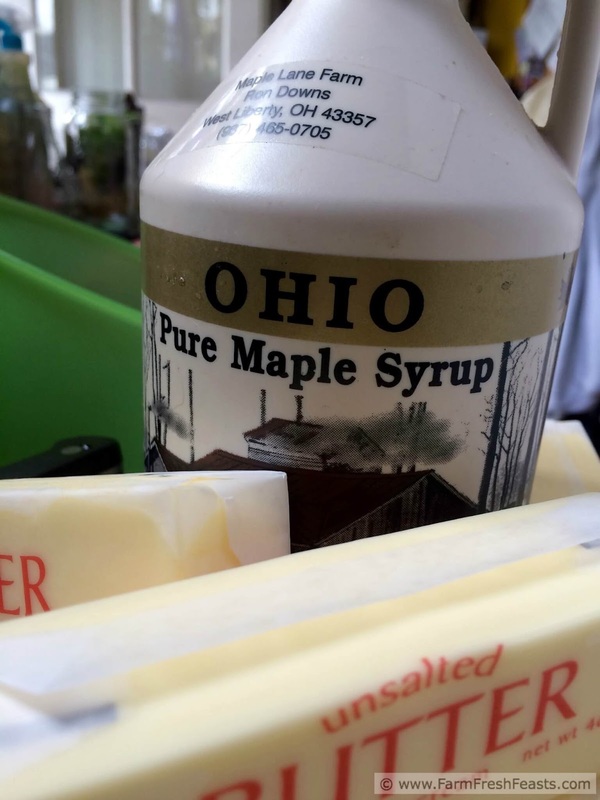 Maple syrup is so yummy--no need to create an artificial thing and mess with success. I was pleased to find 2 places close to home that sold locally-sourced maple sugar, but I realize that Dayton is a special place and YMMV. Sounds fantastic! I've recently been getting into holiday breads (mmm ... orange + cranberry), but I clearly have to start adding cookies to the mix. Cookies! Many many many COOKIES. Oh, and rum cake, too. Got to have that! Rum cake? I'm intrigued. My family makes rum balls (and non-alcoholic rum balls using rum extract to send to the troops in the MidEast who are not allowed the Real Thing) but I have not had a rum cake. You can never have too many cookies!! I dunno, after all the baking (and No Bake-ing) I've done for #ChristmasWeek, PLUS the amazing cookie tray I was served at lunch yesterday . . . I could take a break from cookies for a few days. But I'll be raring to go for the cookie exchange I'm going to next week! What a delicious combination of flavors! Few ingredients? Ha! Wait until you see the No Bake Magic Cookie Truffles. They hardly have anything. Of course, give me a can of sweetened condensed milk and a Basset at my side and I really don't need anything else either. That's like slapping a "gluten free" label on a package of steaks! Awesome cookies! Love the flavor of real maple! How can you not love these cookies!! The name makes me smile every time I say it! Maple Doodles!! See I can't stop smiling!! You rock the world. I love maple, it runs through our veins here in Canada. These cookies are amazing. That you even thought to tell people not to use breakfast syrup - I have no idea who those people are. I don't have maple sugar, but if I'm going to go on a quest, that's as good a one as any. Love the cookies in any event.